More than 100 students from the University of Illinois Springfield spent their day learning and volunteering in the community as part of the national Martin Luther King Jr. Day of Service on January 15, 2018. Students started their day on campus with breakfast and a simulation experience, and then participated in the Springfield NAACP Unity March and a community town hall at Pleasant Grove Baptist Church. Following the town hall, students spent their afternoon volunteering at nine locations in Springfield. Students sorted donated computers at Computer Banc, prepared items for sale at the Habitat ReStore, sorted medical supplies at Hospital Sisters Mission Outreach, painted at Inner City Mission, sorted and organized books at the Northside Children’s Community Library (located in the basement of Third Presbyterian Church), helped around the house and sorted donated items at the Ronald McDonald House, cleaned up and repaired classrooms at the Springfield Urban League and sorted and preparing art kits for patients at HSHS St. John’s Hospital Women and Children’s Center. On campus, students made 15,000 bookmarks to be distributed to Springfield District #186 elementary students, in partnership with the United Way, during an event in the UIS Student Union Ballroom. In 1994, Congress passed the King Holiday and Service Act, designating the Martin Luther King Jr. Federal Holiday as a national day of service and charged the Corporation for National and Community Service with leading this effort. Taking place each year on the third Monday in January, the MLK Day of Service is the only federal holiday observed as a national day of service – a "day on, not a day off." 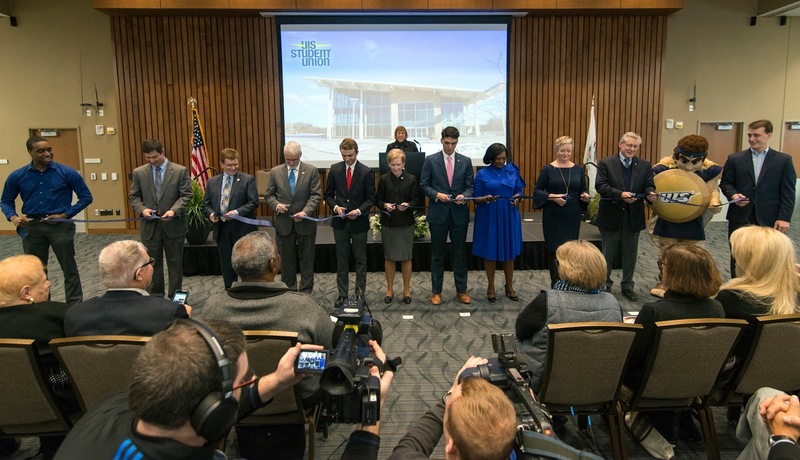 The University of Illinois Springfield officially opened the new $21.75 million Student Union Building during a ribbon cutting ceremony on Sunday, January 14, 2018. The first-ever student union will serve as a social hub for student life and foster a greater sense of community on the growing campus. UIS Chancellor Susan Koch was joined by U of I President Timothy Killeen, Springfield Mayor Jim Langfelder and student leaders in cutting the ribbon. The two-story, 50,000-square-foot student union anchors the campus’s south quad, providing campus dining services, a Starbucks coffee shop, a ballroom with seating for up to 450 people and a Student Leadership Center that houses student government, volunteer offices and workspaces for student organizations. In her opening remarks, Koch thanked the UIS student leaders who saw a compelling need to build the facility; U of I System leadership; faculty, staff and students who served on the planning committee, architectural partners, UIS staff who made the building possible and donors for their generous support. Approximately $6.25 million in private funds has been raised towards the $8 million goal to fund the construction of the $21.75 million facility. The private fundraising effort continues. The remaining cost will be paid through campus funds and a construction fee that students approved in 2012. The new facility will fill a void that officials say has grown since UIS became part of the University of Illinois system in 1995. The campus was originally founded in 1969 as Sangamon State University, catering to upperclassmen and graduate-level students, but is now a traditional four-year school that lacked the central gathering place that student unions provide at most colleges across the nation. An open house immediately followed the ribbon cutting. Food Service and Starbucks will begin regular operations in the building when students return to campus for the beginning of Spring Semester 2018 classes on Tuesday, January 16.